200+ questions within 35 categories, matches full LifeBio.com biography. Updated 2017. Hardcover 6 x 9 book. The Memory Journal provides the perfect place to tell YOUR story - YOUR way. No matter your age, the time is NOW to record your experiences to be preserved for future generations. This Memory Journal has been updated by Beth Sanders in 2017 to include the most recent historical event topics. The user-friendly journal contains over 200 carefully-crafted life story questions with plenty of space to write answers for yourself or a cherished loved one. It asks the right questions to bring out the best stories and memories! The journal covers thought-provoking topics including: family history, the people who shaped you, childhood memories, love and relationships, education, work experience, military life, family fun and vacations, life lessons, and much more. One especially unique feature of our LifeBio Memory Journal is that it coordinates with the option to choose to use LifeBio's online website as a next step to help finish the story in printed book form (www.LifeBio.com). Once the answers are online, it easy to create multiple copies of your book to be shared with family and friends. 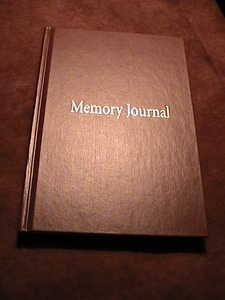 The Memory Journal is designed to be whatever the author wants it to be. Perhaps a parent will capture memories for his or her children. A grandchild could use the journal to interview a grandparent. This can be the first draft on paper of your autobiography and later the answers can be transferred online to create a professional hardcover book. However the Memory Journal is used, it becomes uniquely YOURS--just like the life story it will help preserve! THE LIFEBIO MEMORY JOURNAL MAKES A GREAT GIFT, TOO! Over 200+ carefully-crafted biography questions in a beautiful hardcover 6 x 9 inch book with book jacket. The book, without jacket, is brown with "Memory Journal" in gold lettering. All questions match LifeBio.com's online template for easy transfer from the journal to the computer someday (if you wish). Perfect for the person who would rather write than type (or for people without a computer). Great for visiting and interviewing a loved one too! Wonderful tool to take to a reunion. 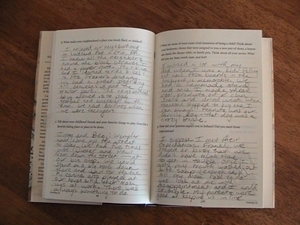 Each page includes two questions with lines provided for writing in answers. The LifeBio Memory Journal also works well as a first draft. Ideas and memories from the LifeBio Memory Journal can be transferred to an online LifeBio and then into a hardcover, leather-bound Legacy Book.